Today's early morning news brings us a look at next year's rumored release of the "Concord" Air Jordan 11 Retro Low. First seen on MJ's feet during the Bulls' 1996 Championship celebration parade, this low-cut Air Jordan XI is a direct recreation of arguably the model's most iconic colorway. Premium white leather and black patent leather create the timeless look throughout the upper, working with hits of concord purple over the tongue Jumpman and herringbone areas on the translucent outsole below. 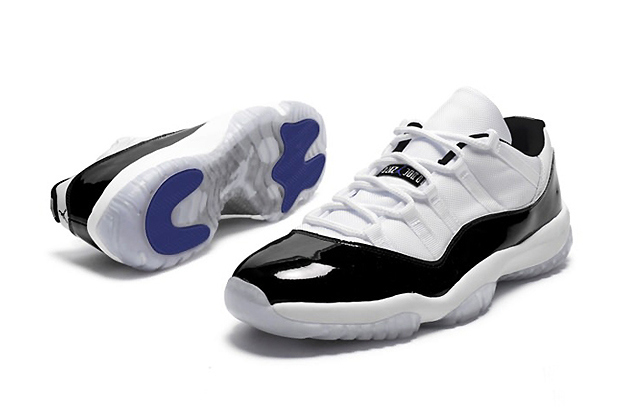 Stay tuned to Sole Collector for further details on the "Concord" Air Jordan 11 Retro Low. For now, enjoy a look at a possible photoshop of the upcoming release below.